Намерете необходимото сега в eTop.bg! Рефрактометри за вино, грозде, мед, алкохол. eTop.bg - Топ качество на най-добри цени! Попълнете телефон и име и наш представител ще се свърже с Вас, за да потвърди покупката ви. 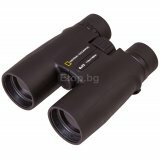 These classic Porro prism Bresser National Geographic 7x50 binoculars are perfect for any nature observations: wild nature studies, stationary observations, or searching and tracking wild animals. All optical elements are made of fully coated BK-7 glass, having a good refractive index and giving a clear image. The device is suitable for spectacle wearers thanks to diopter correction. The binoculars have great design: the body, made of plastic with non-slip rubber armoring, makes the device resistant to shocks, jolts, and even falling from a small height. The focusing wheel is very big and easy to rotate; it allows you to adjust the focus even in gloves. A tripod adapter for mounting the binoculars on a tripod for long-term observations and a carrying bag come in the kit. All this makes Bresser National Geographic 7x50 binoculars the best companion for any hunter or hiker.